The intention of this page is to share a personal experience concerning cat caretaking in the hope that it might help cat owners and cats. We have just been to the veterinary clinic with Cardi, a small female tabby cat. There is a picture of her on this page with lots of detail about her condition up to this point. Cardi had terminal cancer diagnosed about 2 weeks ago. She has been losing weight for about 8 weeks. 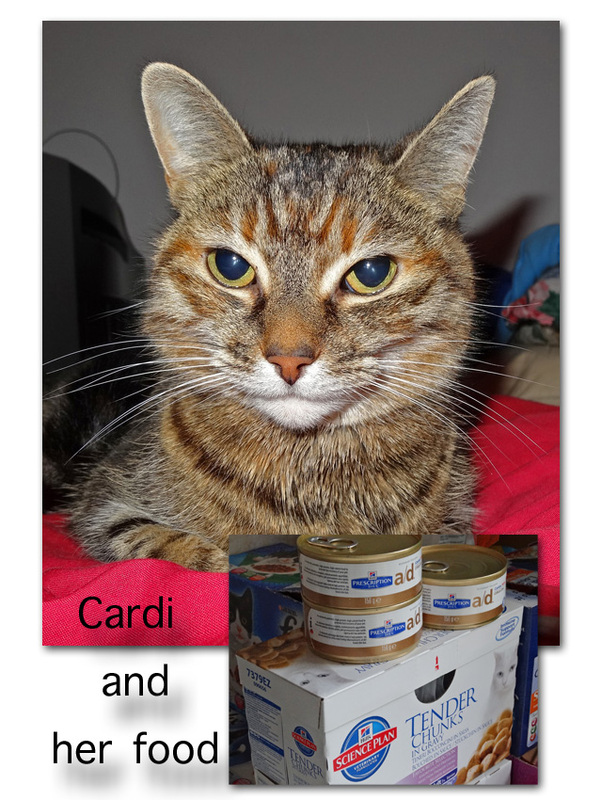 We are looking after Cardi on behalf of her owner who is in hospital. I wanted another up-to-date veterinary opinion on her condition as she continues to lose weight despite being very thin. Cardi has lost her appetite because she has cancer of the intestine. She eats poorly and defecates every 2-3 days. I never thought I would like the smell of cat poo so much 😉 It confirms that the basic body functions are working. Hospice Cat. Photos and collage by Michael. She looks perky and pretty in this picture. Cardi’s vet, Katy, who is excellent and probably even better than that, coined a phrase that I like and which should set the standard and tone of how cat caretakers need to act when looking after a cat that has an incurable and fatal illness. She said that we were a cat hospice for the time being. And that is so right. It is stressful. It is very helpful to take your patient to a good vet for advice. It provides information about your dying cat’s condition that helps make a decision on euthanasia, which is the most difficult of all the decisions a cat guardian might have to make. I feel that you have to remove from the decision making process as much doubt and uncertainty as you can and be armed with all the information that you can obtain. Then you can make a good decision. The decision on euthanasia is a particularly onerous one when you are taking care of a cat on behalf of the owner when the owner is not in a position to provide any input of their own. The trip to the vet could have resulted in euthanasia there and then but I went in open minded. Katy felt that Cardi was not quite ready to leave us despite losing about 1.3 kilograms since the last visit. Cardi weighs 2.69 kilograms today. This is 5.93 pounds. Katy thought Cardi may have about three more weeks. But it may be longer. Every animal including our cat companions have a right to life and where there is life it must be granted if it is in our power to make that decision. Cardi is not in pain. If she was the decision to euthanise would have been taken today. Katy gave Cardi a steroid injection near the site of the cancer to boost the body’s ability to fight the disease and to help reduce inflammation. Cardi was a complete angel in the car and at the vets. She did not make a single sound throughout the entire experience and was beautifully behaved. Cardi does have what may be a sore tooth, which may be a contributing reason why she eats less than adequately. Nothing, really, can be done about that at this stage. She ate pretty well on her return. I have bought some more highly palatable, high nutrient content, semi-moist cat food for her: Hills a/d, and also some Hills high quality standard wet cat found in pouches. You can see them in the picture. We are a cat hospice. We have an obligation to do what is right for the patient. The vets are Vets on White Hart Lane. If you live in the area, I would recommend them very highly. Associated page: Making Decisions at the Veterinary Clinic by Ruth aka Kattaddorra. This entry was posted in Animal Rights, cancer, Cat Anatomy, Cat Behavior, Cat Health, Euthanasia, Moggie, Respect Your Cat, Veterinarians and tagged cat cancer, cat health problems, cat hospice, veterinarians by Michael Broad. Bookmark the permalink. I think its so unselfish to adopt and care for an older more poorly lady cat especially with the associated costs she’s so lucky to have you she looks a sweet old lady and she must be so grateful shes found somewhere comfortable to live out her last time loved and safe. Thanks Leah. The last two days she has eaten much better. She loves the Hills wet cat food in pouches – she had better, it is so bloody expensive ;). The increased appetite might be partly because of the steroid injection the vet gave her direct into the area of the cancer, the last time we went. Or she is just more relaxed and comfortable. I hope it is the latter. I hope Cardi is still doing OK not many people would take on a terminally ill cat, I admire you for caring Micheal. I am currently feeding her on Hills high quality wet food in pouches which she loves. She eats quite a lot which is a big change. It makes me happy except it is hellishly expensive at over £8 per box of 12 pouches. English prices you understand ;). I also feed Hills a/d which she likes too. She is a worry though. Gosh Michael – poor Cardi and poor you. It sounds like she is weak but fairly happy and maybe content but certainly comfortable. Good on Charlie for being easy going about it. We had a dying cat (I mentioned this cat I ended up with before) and the other cats knew what was going on and gave her alot of space. It’s incredibly sad. I’m sure you will know exactly what to do and since that may be the one thing you are worried about I would suggest a little faith that Cardi will make it clear – there wil be a sign, you will know when she can’t or when she is unhappy or in pain. Until then all you can do is take care of her like you are. She sounds like a sweetheart. Thanks Marc. I just hope the post helps someone when making this difficult decision. It does need a lot of care and consideration. I agree there will be sign. I hope I see it and respond properly. It is stressful. Didn’t sleep that well last night. Cardi couldn’t be in a better cat hospice than yours Michael, I hope she manages to eat the special food and I really hope she chooses her own time to leave rather than you having to decide. Have you heard how the old lady is now? Yours must be excellent vets to care so much about an old terminally ill cat. A friend in the USA with an old cat with bladder trouble is heartbroken that all the vets she sees with him are doom and gloom and giving her leaflets on euthanasia while he is still eating and loving her and walking around tail up. As you say, cats have a right to live as long as that life has quality. Hi Ruth, they are excellent vets. The old lady is making progress (which is fantastic news) but she is very old so there is some doubt whether she will return to her home. She is a strong lady of 98 years of age. Amazing. She is visited regularly and she enjoys her visits. Yes, you’ve run a cat hospice since Cardi arrived. Keeping her comfortable, knowing the inevitable. It is hard on the caregiver. But now she can go naturally hopefully. It’s best I think, unless there is pain. She looks like she is smiling in this photo. Good for you Michael. Lucky Cardi. I wish it could be the same for her elderly companion. She is loved. That is the key. The steroid injection has made her a bit more frisky! True. She does look like she is smiling in the picture. At that time I has been with her for 20 mins. She was very relaxed and content. She looks younger than her age of over 10 years. Overall she has settled in well despite Charlie’s presence. Charlie does not care about her being around. Perhaps he senses she is non-threatening.